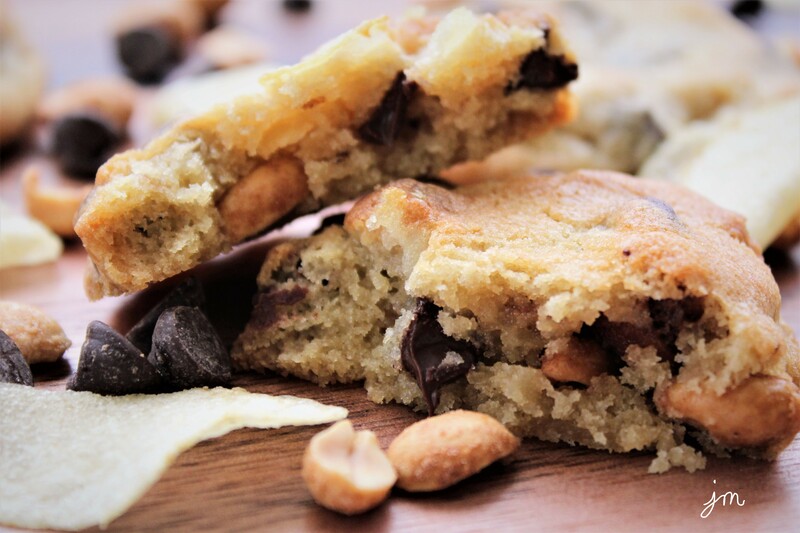 I made a cookie for those midnight cravings when you can’t decide if you want sweet or salty….. chips or peanuts….. a chocolate bar or a cookie……..
Yep… I put it all together in one glorious cookie I’m calling the Midnight Snack Attack Cookie! I simply started with my go-to cookie dough recipe for chocolate chips, but reduced the flour a smidge to make these cookies a little crispier. I then added some seasoned dry roasted peanuts and salty, crunchy potato chips with the semi-sweet chocolate chips. Use any kind of nuts you like. 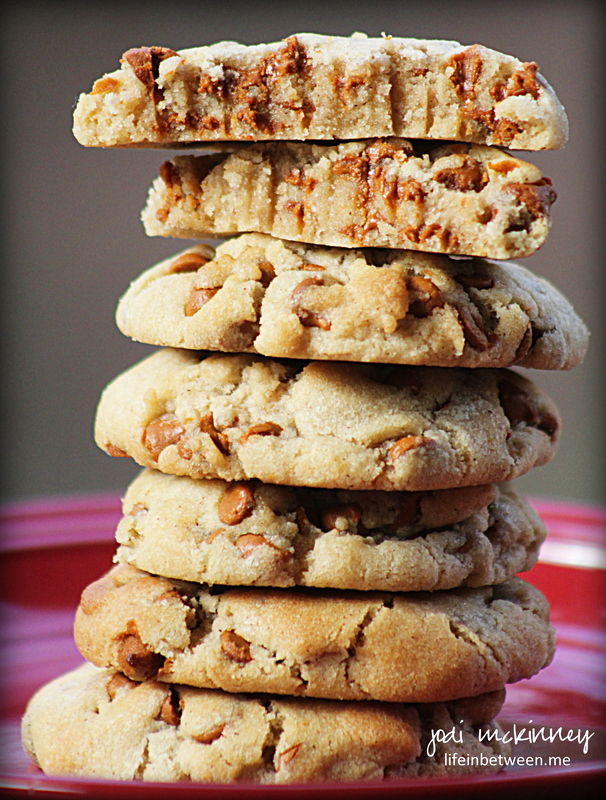 How divine would these be with cashews or salty pecans??!! 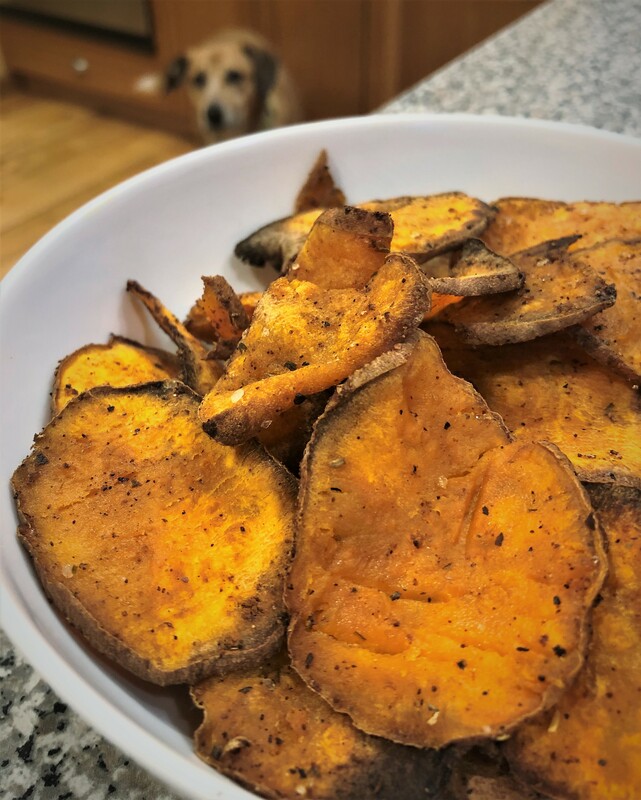 I also think I would like to try them next time with barbecue potato chips. I think it would really kick these up a notch! 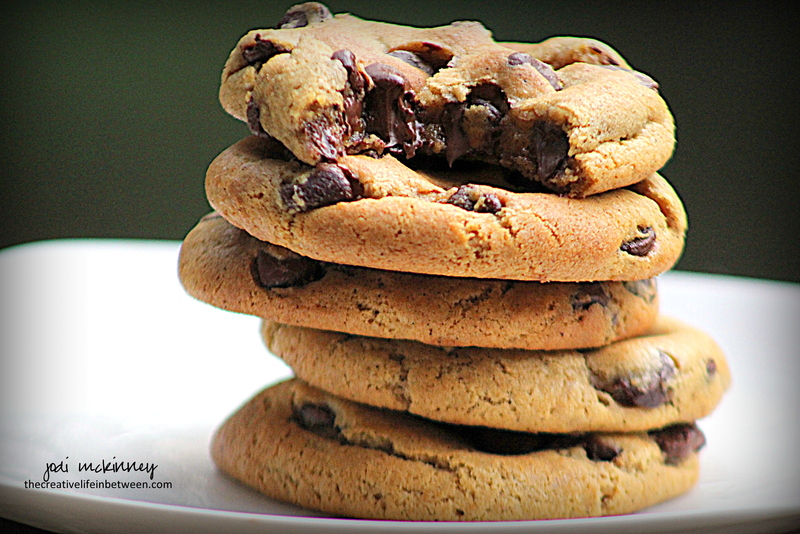 Replace the chocolate chips with chopped Reese’s peanut butter cups or Butterfinger candy bars. I received a gift basket of gourmet cookies for Christmas that had some fun combinations of cookies in them that inspired me to try these. Can’t wait to hear what you think! Fold in chocolate chips and peanuts. Place dough onto counter and gently add in potato chips, folding in with your hands and trying not to crush the potato chips too much. Put dough in large Ziploc bag, and refrigerate for at least 2 hours or up to 2 days. When ready to bake, preheat oven to 375 degrees F. With your hands, form a cookie dough ball about 1 inches in diameter. Place on baking stone. Bake for approximately 11 minutes. Allow to cool on baking stone for 10 minutes, then remove to cooling rack to cool completely. 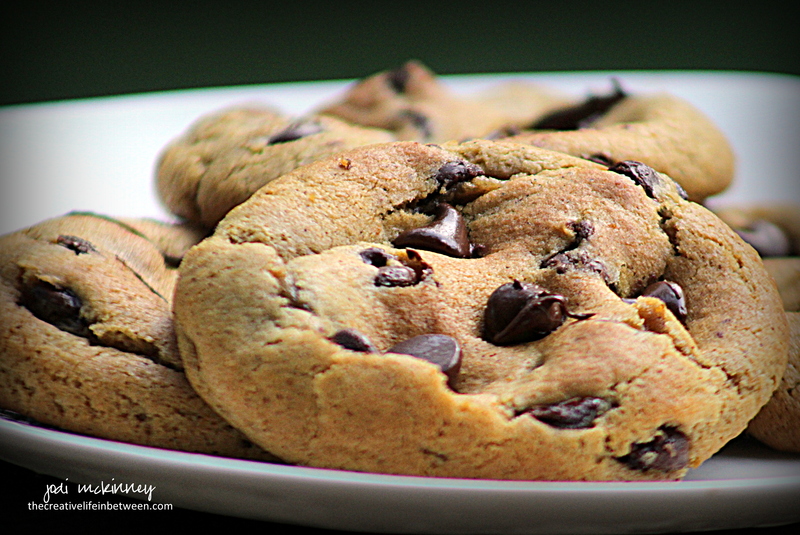 Chewy Pumpkin Spice Chocolate Chip Cookies. 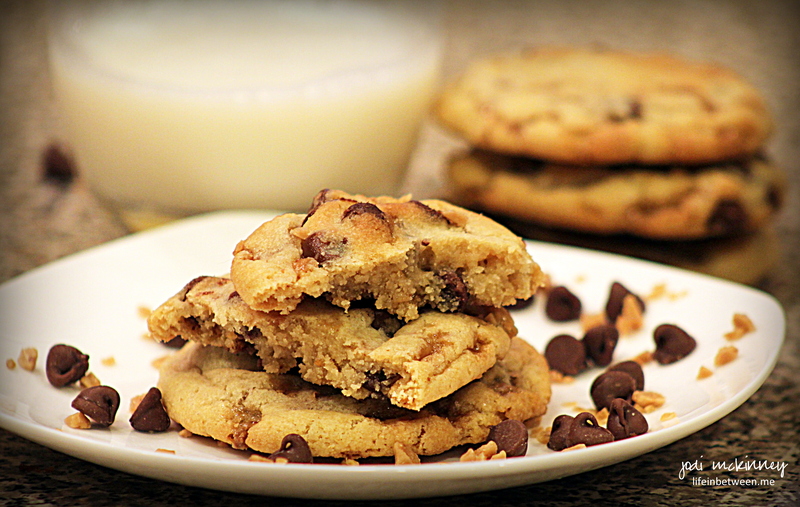 Is anything really better than a good old-fashioned homemade chocolate chip cookie? Well, this time of year, there sure is! After all, it’s pumpkin and spice time. So why not make Pumpkin Spice Chocolate Chip Cookies?! Feel free to vary the spices to your liking. No need to add nutmeg or ginger if you don’t have or don’t like. Feel free to adjust the amount of cinnamon to your taste. Some might like milk chocolate chips in these, but I prefer semi-sweet. Milk chocolate chips seem almost too sweet to me. I found a recipe at Chelsea’s Messy Apron, and tweaked it up to my liking. Here is how I made them. Cover bowl with saran wrap and refrigerate for at least 4 hours or overnight. When dough is fully chilled, and you are ready to bake, preheat oven to 350 degrees F.
Roll dough into golf ball-sized balls. 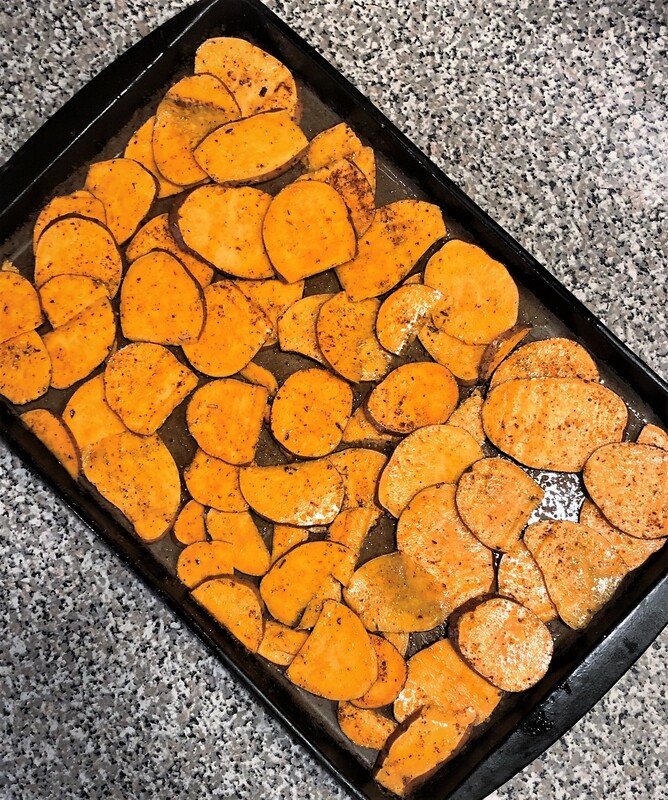 Place on baking stone or cookie sheet, and bake 9-12 minutes until lightly brown on top. Decorate tops with 3-5 chocolate chips after removing from oven, but still leaving on baking stone/cookie sheet. Remove from baking stone/cookie sheet after 5-7 minutes, and cool completely on cooling rack. Once cool, place in large gallon-size Ziploc freezer bags and store in freezer. 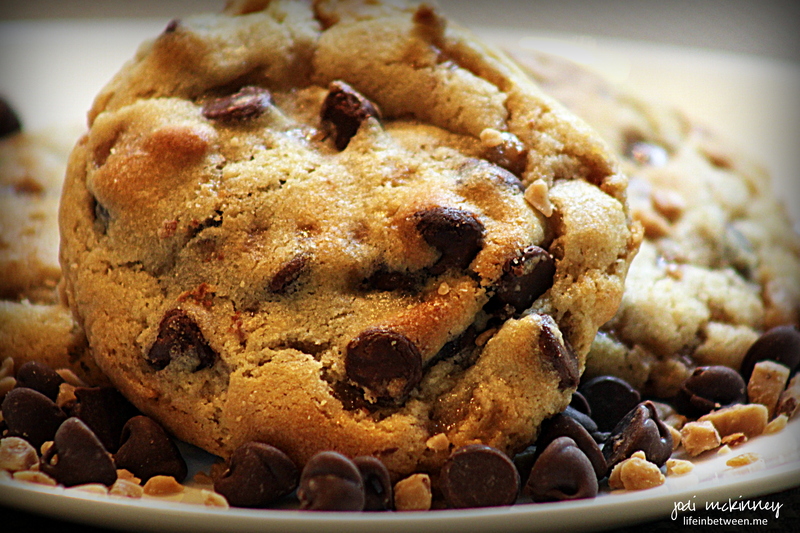 Cookies thaw quickly and taste delicious right out of the freezer. What do you do when you have over-ripe bananas and a half of a can of leftover pumpkin puree (from making Chewy Pumpkin Cinnamon Chip Cookies – which Hubby has officially declared his current all-time favorite cookie!)? 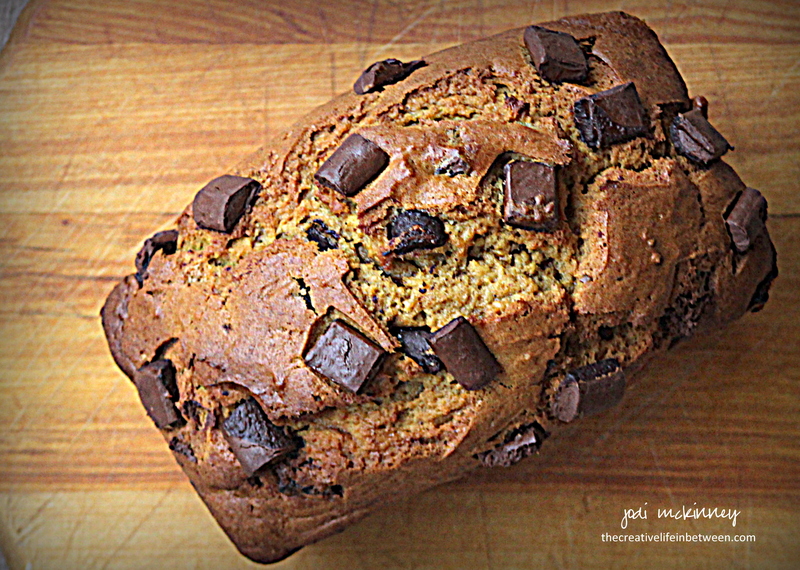 Well – you make wonderfully sweet and delightful Pumpkin Banana Chocolate Chip Bread of course! 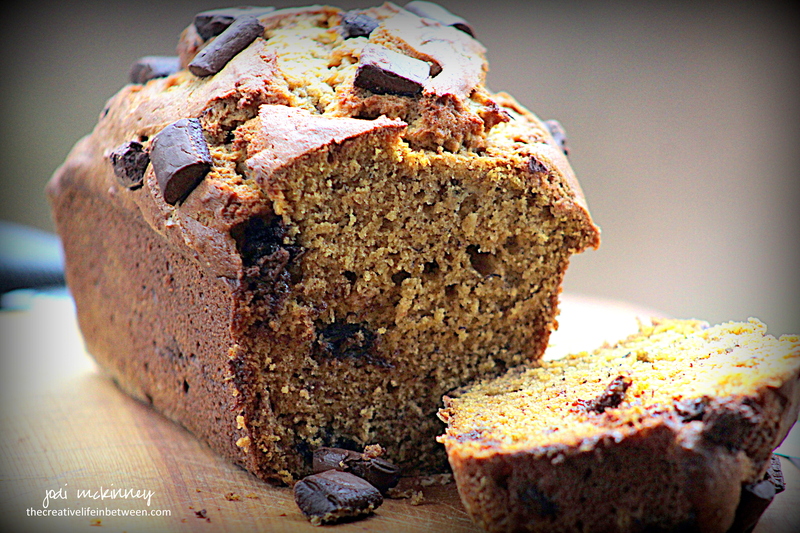 Have you ever thought of combining pumpkin and bananas in a yummy sweet bread? 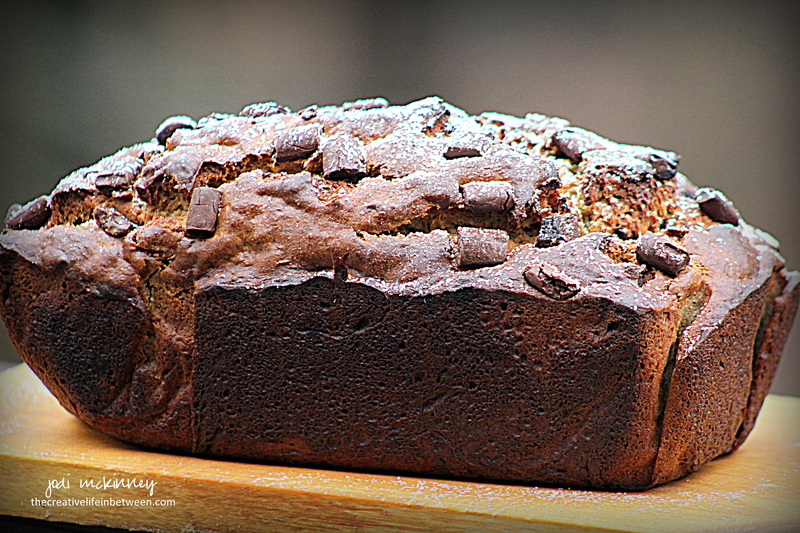 If you are looking for a lovely Autumn sweet bread to enjoy with your morning coffee, afternoon tea, or to curb your after-dinner sweet tooth, look no further. And how fun is it to make four mini loaves instead of one big loaf so you can keep one (or two) and share the others as sweet surprises for friends or loved ones! 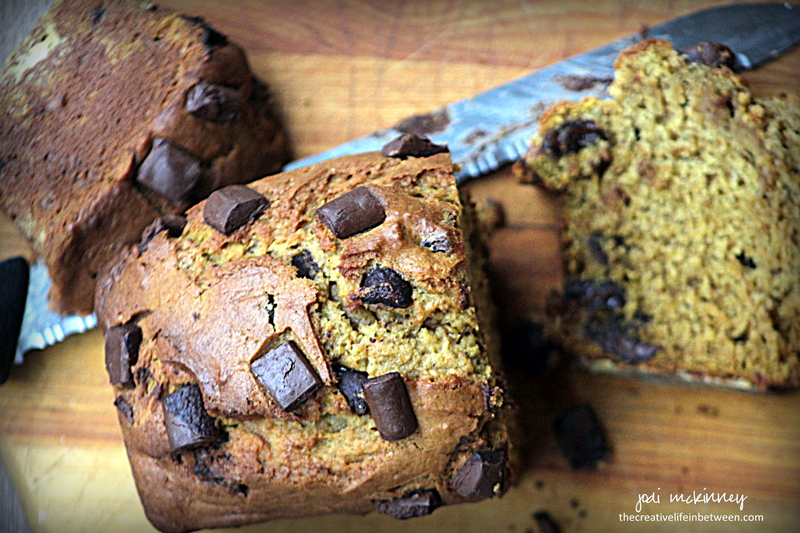 To me, that is more than half the joy in baking…. creating something I can share to make someone smile and brighten their day and tantalize their tummy. 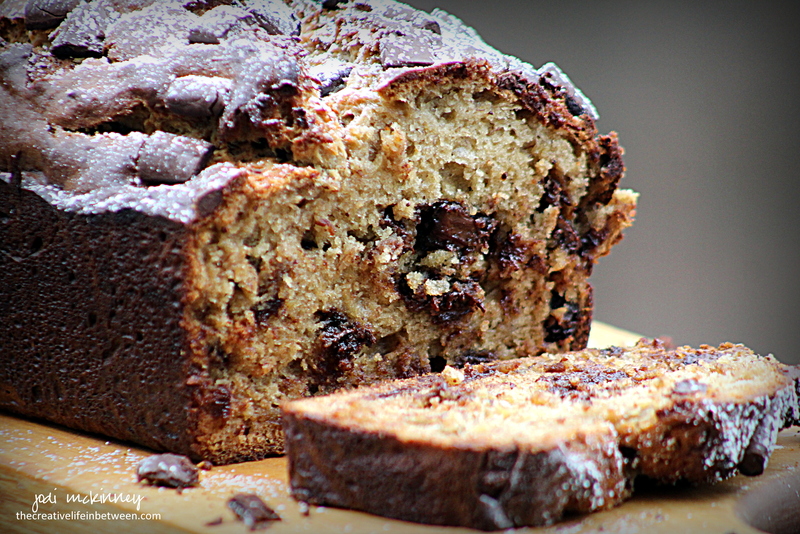 Make this bread to share as a Thanksgiving hostess gift or guest’s sweet surprise. Or just make it to enjoy! I’m betting you will! Warm from the oven, a slice with some melting salty butter is just about heavenly! Cream butter and brown sugar with electric mixer on high approximately 2 minutes. Add eggs and continue mixing until light and fluffy – 1-2 more minutes. Add pumpkin and mashed bananas. Mix well. Add dry ingredients: baking soda and powder, cinnamon, salt, and flour, and beat just until blended. Remove from mixer. Stir in 1 cup of chocolate chips with wooden spoon or spatula. Pour into 4 greased mini loaf pans. Sprinkle tops with remaining 1/4 cup chocolate chips. Cool 10 minutes in pans and then remove loaves to cooling rack to completely cool. I’ve been bursting with excitement to share this recipe that is bursting with cinnamon flavor! I daresay this is my absolute FAVORITE new cookie recipe. So cinnamony perfect and delicious for this time of year! 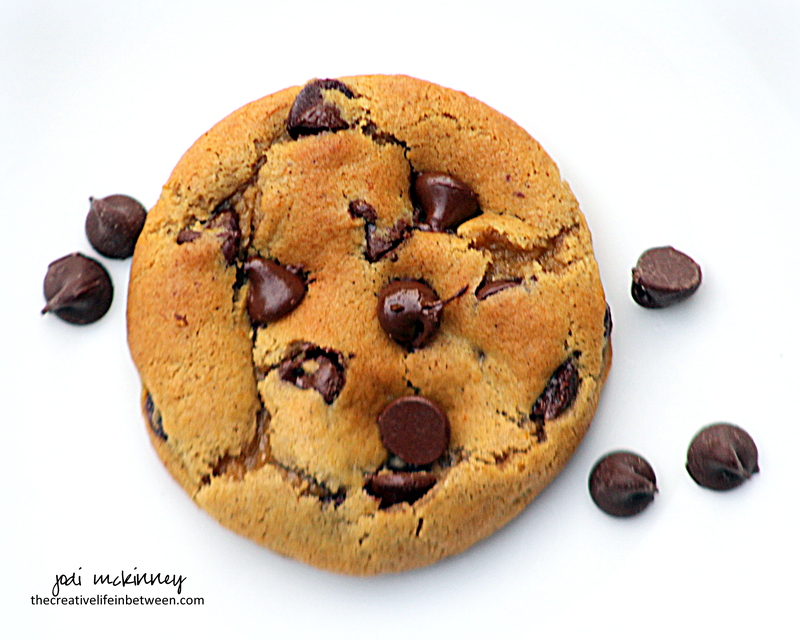 If you are a fan of cinnamon, this cookie is going to ROCK your WORLD! I found this recipe on LemonsforLulu’s blog and couldn’t wait to try. I’ll be waiting to hear! In a bowl of a mixer, combine butter and sugar and beat until creamy. Add the egg and mix well. Add baking soda, salt and cinnamon, and combine. Carefully add flour and combine until soft dough forms. Stir in cinnamon chips. Drop dough by tablespoons onto baking stone or cookie sheet. Bake just until edges are set, about 8­-9 minutes. Do not overbake. Let cookies cool for another minute or two on the stone or baking sheet before removing to cooling rack to cool completely. 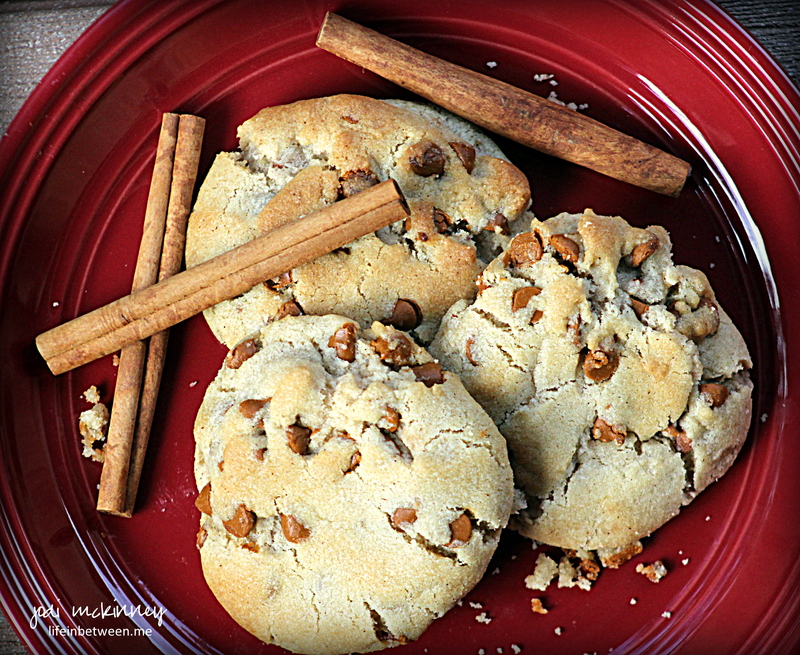 These are absolutely the most amazing cinnamony luvin’ from the oven cookies ever! Look no further. Your search has ended. Bells are ringing. Angels singing. 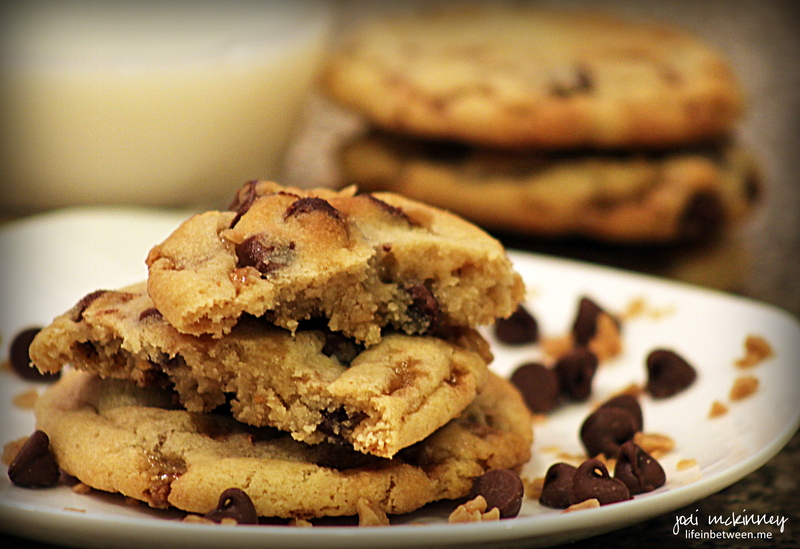 These blissful cookies will become a family favorite. I dare you to each just one. 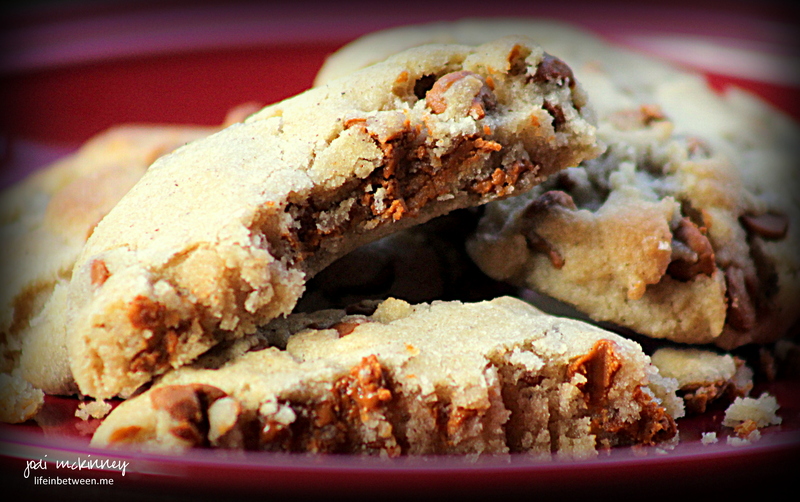 Fold in Milk Chocolate Chip morsels and Toffee Bits. Refrigerate dough for at least 4 hours or up to 2 days. When ready to bake, preheat oven to 375 degrees F. With your hands, form a cookie dough ball about 1-1/2 inches in diameter. Place on baking stone. Bake for 8-10 minutes. Do not overbake. Allow to cool on baking stone for 2-3 minutes, then remove to cooling rack to cool completely. I love waking up early on weekend mornings. After all, it means extra hours in my weekend! This past Sunday, I got up before anyone else was awake and basked in the moments of pre-dawn with freshly-brewed coffee and Italian Sweet Cream, the opportunity to paint, and the chance to bake something yummy for breakfast before anyone was awake, so they could rise to the smells and tastes of fresh baked scones. Awwhh! 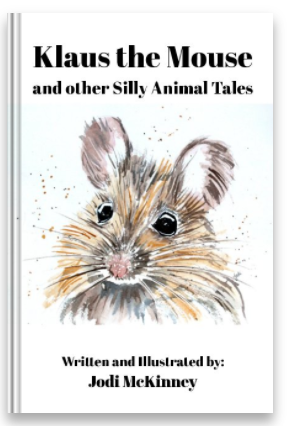 This is my happy place…. 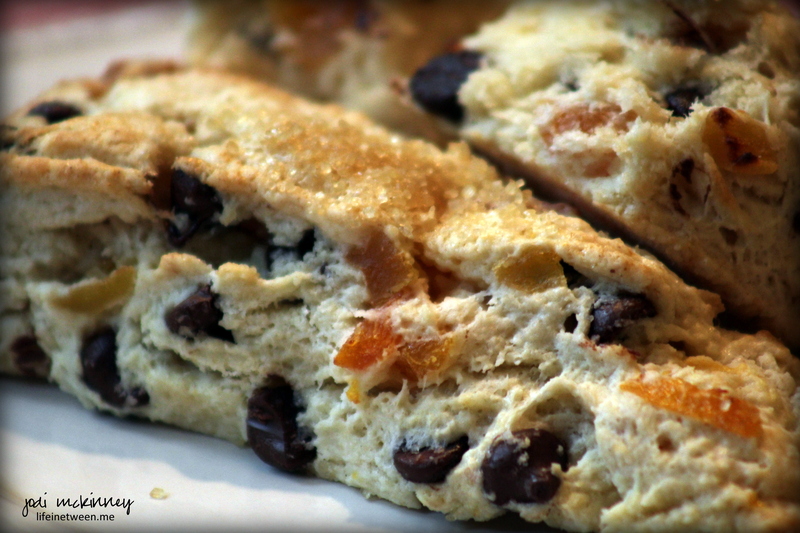 Scones are quick and easy and so delish! They throw together quickly and bake in 15 minutes. 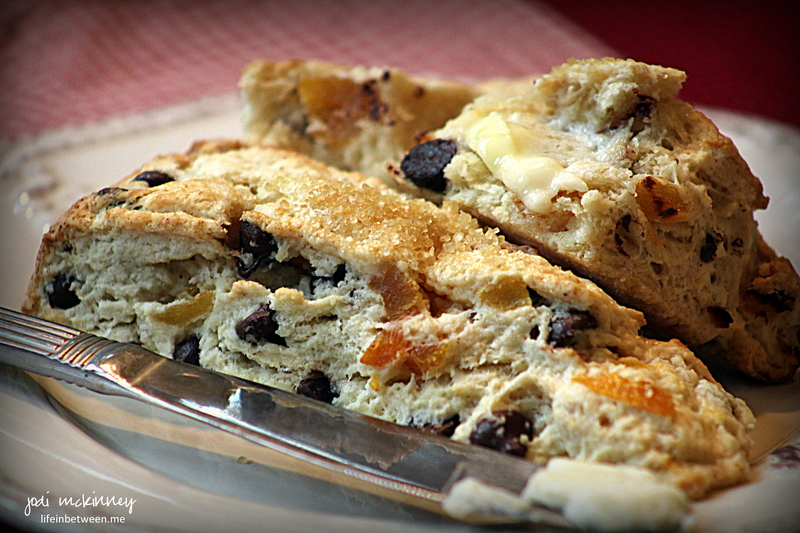 These Apricot Chocolate Chip Scones were well received by the sleepy eyes waking up at our house. 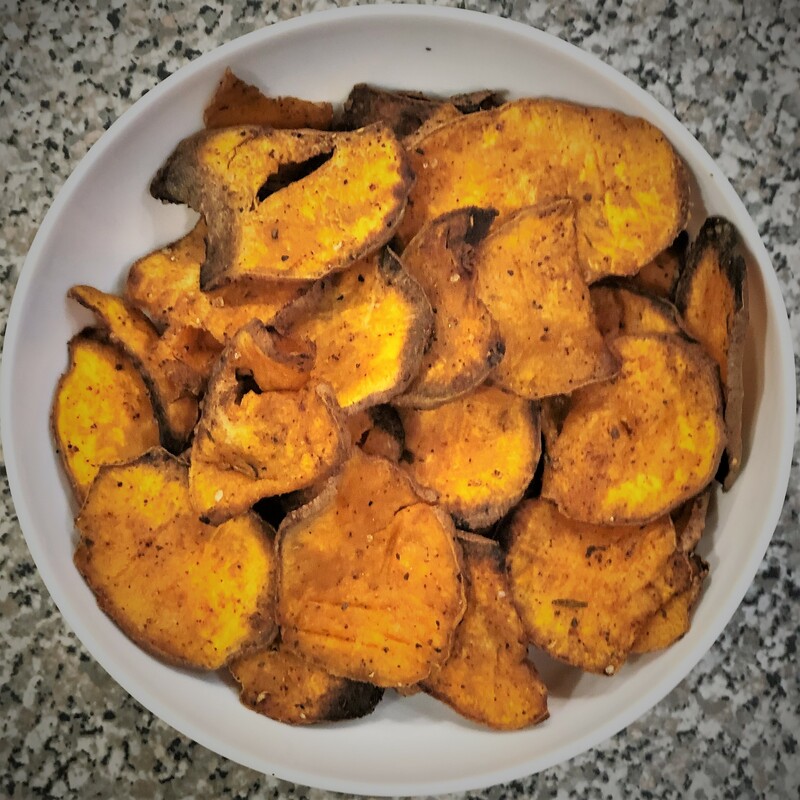 Slather them with a little butter or dunk them in your coffee or tea, and you may have found nirvana…. just sayin’. In large bowl, combine flour, sugar, baking powder and salt. cut in butter with pastry blender until crumbly. Stir in apricots and chocolate chips. Add eggs, half and half and vanilla, and mix until soft dough forms. Turn dough onto floured surface and knead lightly. For dough into rectangle approximately 15 inches wide by 4 inches high. Cut in half, then each half in half, and each half in half again until you have 8 equal sections. Cut each section in diagonal until you have 16 triangular sections. Placed on baking stones or greased baking sheets. Brush top of each with a little more half and half and sprinkle with coarse raw sugar if desired. PS You might also like my “almost famous” Cinnamon Chip Scones. Click here for the recipe. They are an all-time fave! O – M – G ! 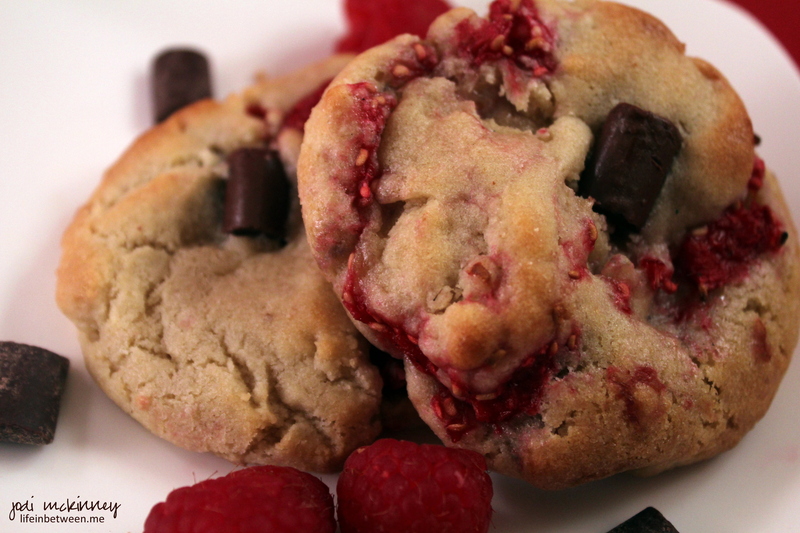 Fresh raspberries meet freshly baked homemade chocolate chip cookies – Can you even imagine the yumminess?!?! You see I have a very special house guest arriving tonight. My sweet McSister, Kelly. All I did was take my standard chocolate chip cookies recipe and fold in some fresh raspberries. 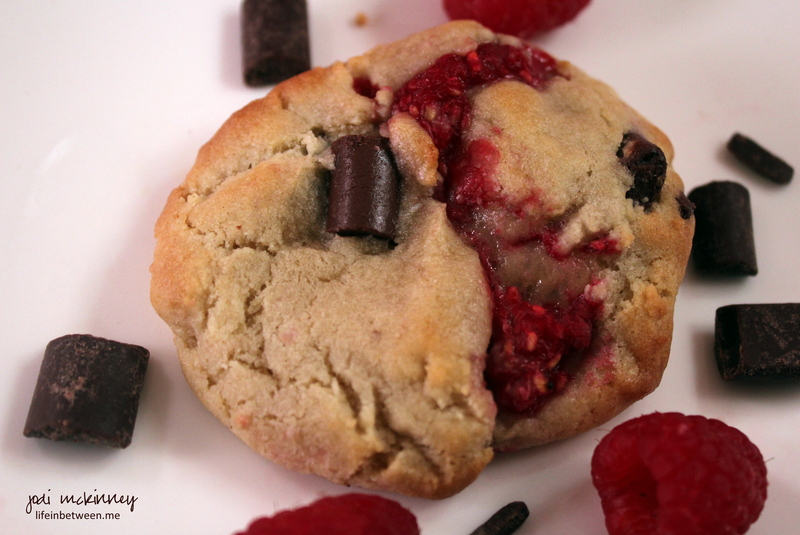 In order to avoid making a big pink, smooshy mess of the dough, I simply added a fresh raspberry to each ball of cookie dough as I formed it assuring that some of the berry remained in tact and the rest spread around to flavor more of the cookie. 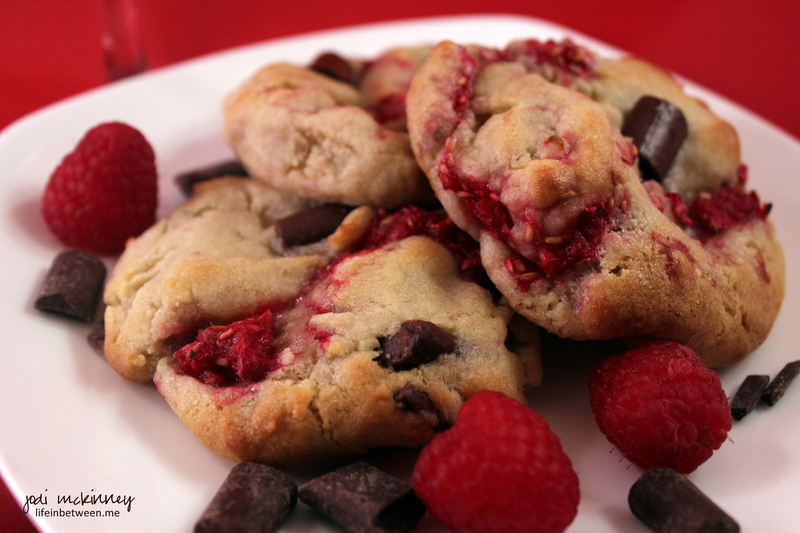 If you love red raspberries, you are going to go crazy for these! I hope my McSis likes them. Several years ago, I was on a business trip to our Northeast PA office in Wilkes-Barre, PA. It was a newly acquired entity to our business, and I didn’t know many of our new employees. I don’t remember a lot of the details of the trip, with the exception of one biggie – the town decided to flood during my trip. It was scary! People were being evacuated, businesses were closed, and I was very anxious to get home. Problem was – every road that led back home was flooded – even the major interstate. Try as I might to drive home, I kept getting turned around and blocked by rushing water. Giving up, I found the first hotel in the town I was in when I got stuck, but alas no room at the inn… At every place I tried…. Kelly was one person in this area that I had talked to at least a couple of times. 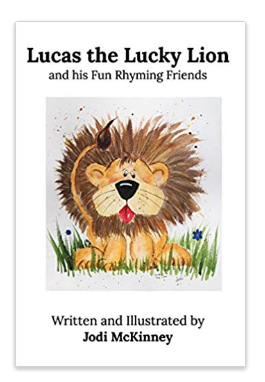 I had her number in my cell phone, and I called her, practically in tears, seeking direction. We laughed, we cried, we drank, we ate, we hugged, and we formed a bond that I will never ever ever forget. My sweet Kelly has moved away from that area to a warm southern climate where her hubby got a new job, but she is still a valuable member of our company’s hospice team and a lifelong friend. So when she informed me she was heading to Mars to visit our HQ office, there was no questions where she would be staying. Her room is waiting. Cookies are baked. Olives are ready to be stuffed with blue cheese to float in martinis. And my hubby will finally get to meet my McSister, Kelly. Fold in chocolate chunks. Refrigerate dough for at least 2 hours or up to 2 days. When ready to bake, preheat oven to 375 degrees F. With your hands, form a cookie dough ball about 1-1/2 inches in diameter. Make an indentation with your thumb and place a fresh raspberry in the indentation. Squeeze together, shape and flatten slightly. Place on baking stone. Bake for 8-10 minutes. Do not overbake. Allow to cool on baking stone for 2-3 minutes, then remove to cooling rack to cool completely. To make eating these even more special, enjoy with a nice glass of Port wine. Oooooo Laaaa Laaa!